Meiji Restoration, Charter Oath, 1889 Constitution; Social, Cultural and Economic Changes; Military Power, Sino-Japanese War, Russo-Japanese War. Lesson 1: What was the Meiji Restoration? Sengoku-Jidai, Daimyo, Emperor, Samurai, Peasants, Artisans, Merchants, Battle of Sekigahara, Tokugawa Ieyasu, Shogun, Edo, Kyoto, Sankin Kotai, Bakufu, shinokosho, Commodore Perry, Sonno Joi, Choshu and Satsuma, Tokugawa Yoshinobu, March on Kyoto 1867, Emperor Meiji, Genro, Charter Oath, 1889 Constitution. 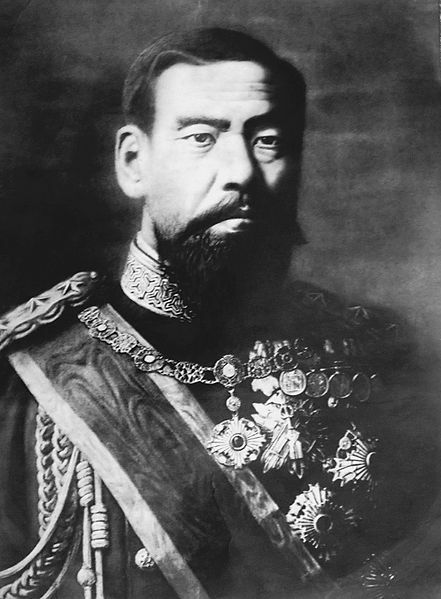 Lesson 2: Historiography - Does the Meiji Restoration deserve to be called a Revolution? What is a Revolution, The Revolutionary Process, Revolution from Below, Revolution from Above, Andrew Gordon, W.G Beasley, Causes of the Revolution, Abolition of Daimyo Domains, New Structure of Government. Two further articles discussing the nature of the Meiji Restoration. The first is a Marxist interpretation of the Meiji Restoration, viewing the Restoration as a reaction by conservative and capitalist elites to maintain their power. The second article is a review of the book A History of Japan, 1582-1941: Internal and External Worlds by the historian L.M. Cullen. Cullen views the Restoration as a rational and measured reform of government, for the benefit of the nation, rather than particular classes. Further article about Revolutions in history and the idea that whilst most revolutions are perceived to be national events, in reality they follow international 'waves' of revolution, aided by modern communications. 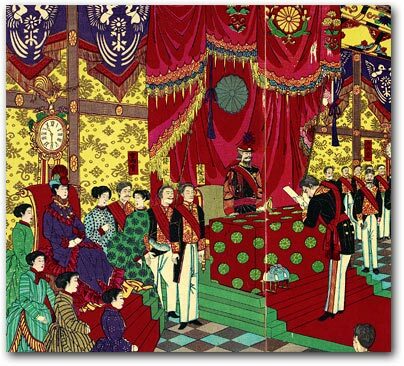 The Meiji emperor bestows the new constitution, which formally established Japan as a constitutional monarchy. The empress is seated at the left. Iwakura Mission 1872, Hirobumi Mission 1882, Modernisation, Westernisation, Problems facing Meiji Reformers, Abolition of the Samurai, Satsuma Rebellion, Social Changes, heimin, burakumin, Education System, Meritocracy, Cultural Changes, Newspapers, Publishing, Shintoism, Bushido, Emperor Worship, National Land Tax, Zaibatsu, Economic Growth. Lesson 4: How and Why did Japan become an Imperial Power? Yamagata Aritomo, Imperial Army, Mass Conscription, Treaty of Kanghwa, Imperial Rescript to Soldiers and Sailors, Pan-Asianism, Sino-Japanese War, Treaty of Shimonoseki, Anglo-Japanese Alliance, Russo-Japanese War, Treaty of Portsmouth, Annexation of Korea.